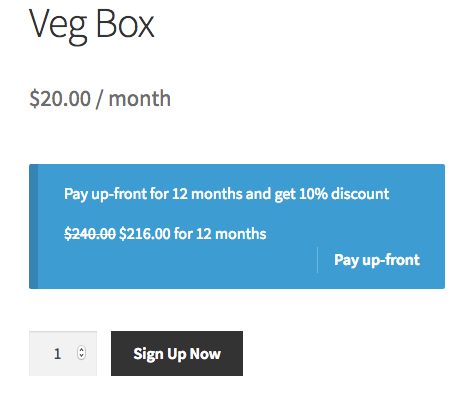 Let's say, you are selling a vegetable box on a monthly subscription at $20 per month. You can provide your customer to pay up-front for a year instead of paying every month. The customer gets an assured supply of the product, while, as a store owner, you get paid in full for a year. 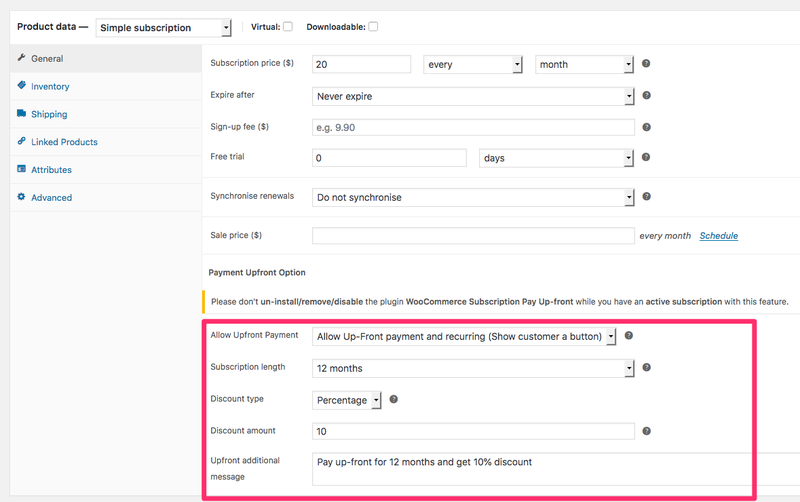 You can choose to allow both monthly and up-front payment options for the subscription product. NOTE: This plugin requires WooCommerce Subscriptions (purchased separately) to function. Download the extension in .zip format. Go to Plugins > Add New > Upload and select the ZIP file you just downloaded. Click Install Now, and then Activate. 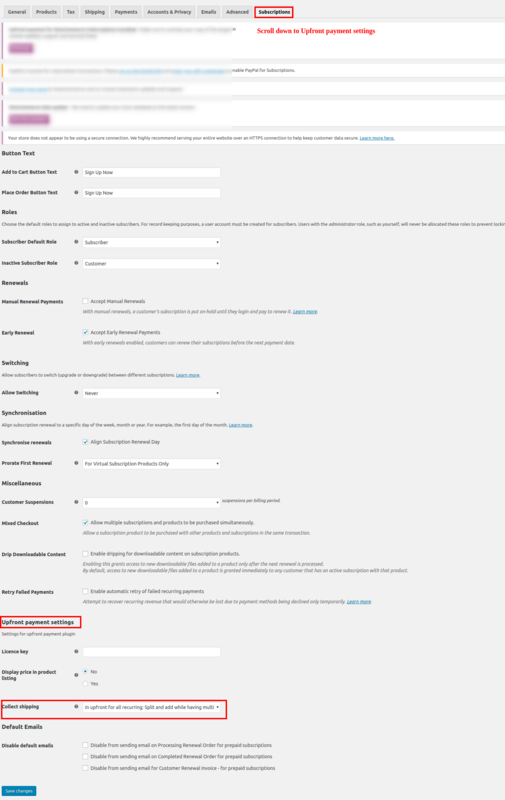 The guide assumes that you already have installed the WooCommerce Subscriptions. You can view more guidelines on translating extensions here. Go ahead and create a subscription product or open an existing subscription product. In the General Tab, you will see the pricing options. Right below the pricing fields, you can find the upfront payment fields as well. Allow upfront payment only - This only allow an upfront payment for a subscription product. Useful when you have subscription length is pre-defined (example: Subscription ends at 12 months). So you may want to allow both monthly and a one-time payment for whole subscription length. The total length of the cycle that you wanted to use for up-front. Example: 12 months mean = The cost of 12 months will be taken as up-front. You can offer either a "Percentage" discount or a "Fixed cost" discount. This text will be shown at the product page in store front. Let's assume that you are selling the subscription on a "monthly" basis. It never expires. 2. 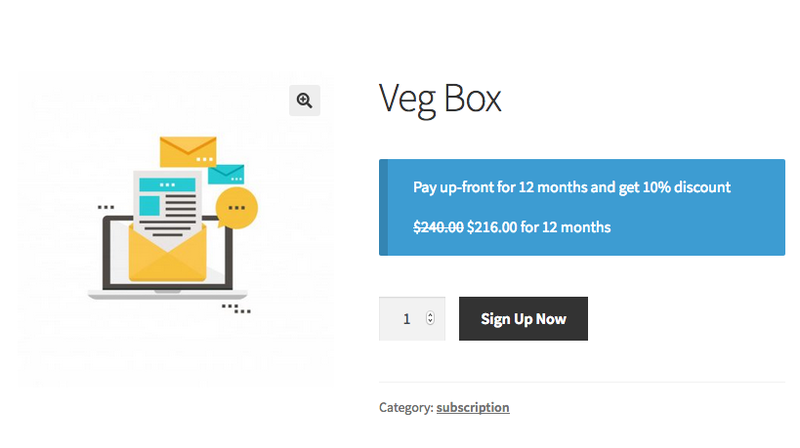 Monthly subscription, which runs for 12 months. To motivate the customer to pay up-front, you may want to offer a 10% discount. In the storefront, the upfront option will display depending on your selection. Notice that it does not show monthly pricing or a separate pay-upfront button. The plugin also has options to collect the shipping cost up-front. This will be useful for store owners selling physical goods in a subscription model. So when a customer pays upfront for a year but the product ships monthly, you may want to collect the shipping cost upfront as well. 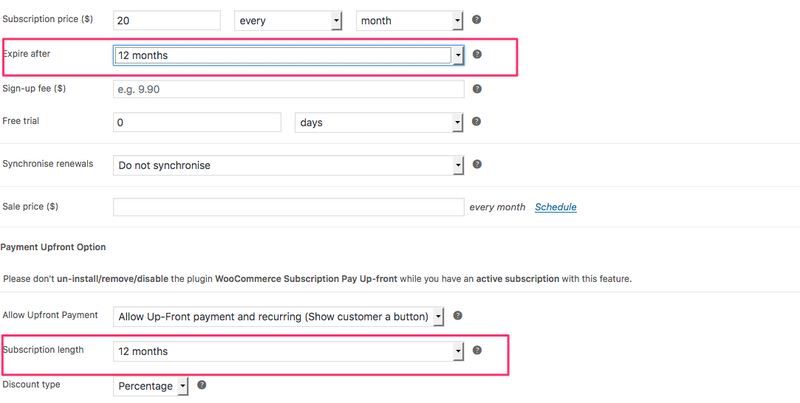 Go to Woocommerce --> Settings -> Subscriptions. Scroll down to the Upfront Payment Settings. You can see the shipping methods. When two or more subscription products are added to the cart, the shipping cost for each product will be split and collected accordingly. 1. How the pre-paid subscriptions are managed ? Managing the pre-paid subscriptions is very easy. Since the payment has already been collected, the customer would not be charged till his pre-paid billing cycle. Example: if customer pre-paid for 12 months of his monthly subscription, he would not be charged monthly. But an order with zero value will be created just for the record. You will see these auto-generated orders with a text "pre-paid"
2. What happens when a pre-paid period is completed? The customer will be returned to the normal billing cycle. Example: You have a monthly subscription. Customer prepaid for 12 months (1 year). Till 12 months, the customer will NOT be charged. At the end of 12 month period, the customer will be returned to the monthly billing cycle. 2. Is there an option to notify via e-mails when a pre-paid period ends ? Yes. You can notify the customer when their pre-paid subscription ends. 3. When customer pays upfront for a monthly subscription, will a renewal record be generated for every month ? Yes. A "zero" value renewal order will be auto-generated. This is just for the record. Customer will NOT be charged every month if he already prepaid. 4. Does upfront payment support free trial ? Sorry. No. When a subscription has a free trial, upfront payment is not possible. This is something we are working on. NOTE: DO NOT DELETE OR DEACTIVATE THE PLUGIN IF YOU HAVE PREPAID SUBSCRIPTIONS RUNNING ON YOUR STORE. IF YOU DO SO, THE USERS WHO HAVE SUBSCRIBED FOR PREPAID SUBSCRIPTIONS WILL BE GO BACK TO THE NORMAL SUBSCRIPTION TERM WITH IMMEDIATE EFFECT.